Huge thanks to everyone who voted for me for On the Rise! I am so honored and excited to be a part of this amazing group of YouTubers that have been featured in the past. YouTube is such a huge part of my life and I love that more viewers will get to see the videos I work so hard to make! If you are not familiar with my channel, it might be slightly different than what you are used to. I have hundreds of mostly creepy, often hilarious videos about the paranormal world. But that’s not all ... I even have some zombie videos! whose first YouTube video got more than 3 million views). To thank these loyal YouTubers for being so awesome, we brought them to L.A. to be part of the Big Live Comedy Show on Sunday, May 19. We gave them a special VIP experience that included a glamorous walk down the Red Carpet, a backstage tour, and tickets to the Big Live Comedy Show and the after party. The Super Seven dropped everything and flew in from all over the country (and world) to attend: the U.K., New Jersey, South and North Carolina, and Washington state. They came together for their love of YouTube comedy, and they were not disappointed. The day was full of smiles, vines, tweets and videos as they met their favorite comedians, including (but not limited to!) Smosh, Hannibal Buress, Reggie Watts, JASH, Tim and Eric, Skrillex and "Workaholics." At the end of the night, they tore up the dance floor with countless Comedy Week performers. 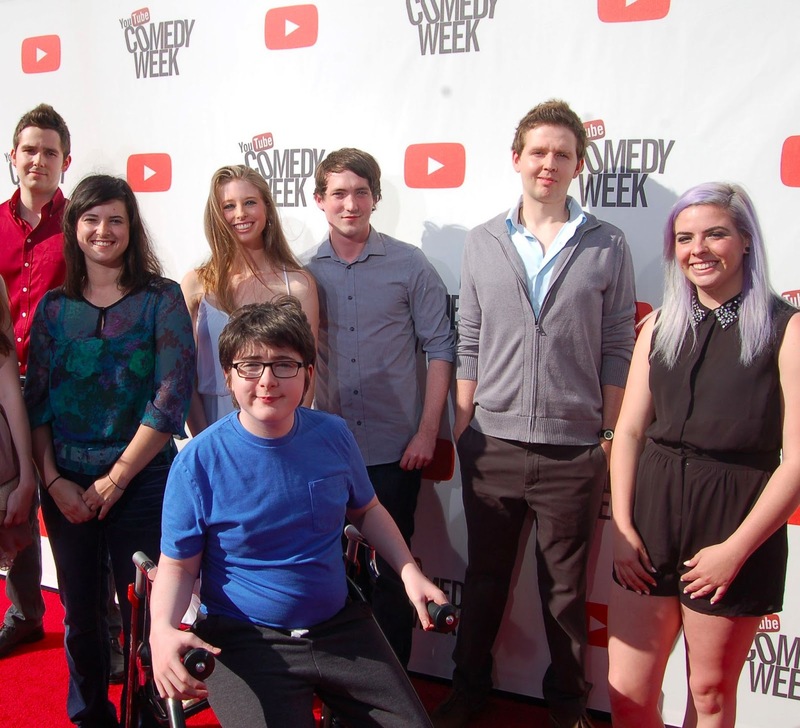 Create a Top 10 list of your favorite YouTube Comedy Week videos and tweet it out to us @YouTube #ComedyWeek. Show us your best spit take, and post the video to #SpitTake. We’ll highlight the funniest and most creative renditions. There’s a world of amazing comedy out there, and it’s all coming together for one side-splitting week. Be sure to keep laughing--and keep us laughing. Marion Dickson Waelchli, YouTube Global Customer Relationship Management (CRM) Lead, recently watched "DJ Play My Song (Now Leave Me Alone)" by The Gregory Brothers, ft. PSY. What do you get when you combine world-famous comedians with the world’s biggest video-sharing site? OK, you guessed it: YouTube Comedy Week. But Comedy Week is about a lot more than simply bringing together comedy’s best and brightest for an online celebration of funny. This week we also connected with YouTube’s biggest comedy fans. We decided to shine our spotlight on seven "Super Fans": Zach, Christine, Mavis, Lo, Jesse, Mike and Jack (the 14-year-old "Britain’s Got Talent" comedian whose first YouTube video got more than 3 million views). in Singapore is attempting such a feat—running an awards program for a full 24 hours via social media. Forget a few dozen statues going out to some lucky winners. How about a whopping 288 awards, one awarded every five minutes, recognizing everything from top actors and athletes to favorite songs and sports teams. And all that ends with a splash: a live two-hour show full of musical performances and celebrity drop-ins. For those who can’t be there live to watch at Singapore’s iconic Marina Bay Sands Hotel, YouTube is partnering with Starcount to exclusively live stream the whole show on www.youtube.com/starcount. The broadcast will kick off on May 23 at 9 p.m. Singapore Time (6 a.m. PST) with a red carpet awards ceremony where Aerosmith, Cee Lo Green, Carly Rae Jepsen and PSY come on stage to play their hit tunes. From there, you can expect appearances and award presentations from some of YouTube’s most famous faces, including Ryan Higa, HIKAKIN, PewDiePie, and Natalie Tran. With so many awards being handed out, you may be asking, what does it take for me to win a Social Star Award? Check out this video to see some of YouTube’s top talent like Epic Meal Time and DeStorm give a one-of-kind training on how to become a social star. Whether you’re tuning in for the whole show or just dropping by to check out your personal favorites on stage, we look forward to seeing you soon over at www.youtube.com/starcount. Benjamin Grubbs, Asia Pacific Head of Partner Marketing, YouTube, recently watched David Choi & HIKAKIN’s "You Were My Friend (Original) Unplugged." Social media has dramatically changed the way we get to interact with our favorite musicians, actors, artists and athletes, so it makes sense that any awards ceremony celebrating social media also needs to flip the standard red carpet affair on its head. Tonight’s first-ever Social Star Awards in Singapore is attempting such a feat—running an awards program for a full 24 hours via social media. Forget a few dozen statues going out to some lucky winners. How about a whopping 288 awards, one awarded every five minutes, recognizing everything from top actors and athletes to favorite songs and sports teams. And all that ends with a splash: a live two-hour show full of musical performances and celebrity drop-ins. , inform and entertain us every day. Today, more than 100 hours of video are uploaded to YouTube every minute. That’s more than four days of video uploaded each minute! Every month, more than 1 billion people come to YouTube to access news, answer questions and have a little fun. That’s almost one out of every two people on the Internet. Millions of partners are creating content for YouTube and more than 1,000 companies worldwide have mandated a one-hour mid-day break to watch nothing but funny YouTube videos. Well, we made that last stat up, but that would be cool (the other stats are true). And so, this Monday, on our eighth birthday, we’d like to thank you for making YouTube the special place that it is. For showing us how video can create connections, transcend borders and make a difference. For clicking these links even if you aren’t sure what they’ll be, but you trust us. In short, thanks for making us better in big ways and small ones, too. We can’t wait to see what you come up with next. When YouTube’s site first launched in May 2005, we never could have imagined the endless ways in which you would inspire, inform and entertain us every day. since 2007 that enables content creators to earn revenue for their creativity. We’ve watched them build amazing channels that have made YouTube into a news, education and entertainment destination 1 billion people around the world cannot do without. Today, there are more than 1 million channels generating revenue on YouTube, and one of the most frequent requests we hear from these creators behind them is for more flexibility in monetizing and distributing content. We’ve been working on that and wanted to fill you in on what to expect. We’ve been building a YouTube partner program since 2007 that enables content creators to earn revenue for their creativity. We’ve watched them build amazing channels that have made YouTube into a news, education and entertainment destination 1 billion people around the world cannot do without. In past months, featured On The Rise partners like manjulaskitchen and psychosoprano have gained many subscribers and seen their careers take off, in large part due to your support. This month’s poll will be open until May 15, 5 p.m. PT, so don’t forget to vote for your favorite channel. Check back to see which channel will be featured on May 28. Sunshine has been documenting paranormal activity at her house for several years, sharing her haunted videos on YouTube. If you’re into mysteries, ghosts or demons, this is the channel for you. “The hunt is on” over at Heiko Kiera’s YouTube channel, which features all kinds of reptiles. A wildlife videographer both by trade and by passion, Heiko creates videos he hopes will dispel rumors and misunderstanding about fascinating animals like snakes, alligators and crocodiles.
. This audience is defined by its desire to be constantly connected, and at the center of creating and curating content for social communities. DreamWorks Animation’s major announcement underscores a shift in consumer behavior, and now, Nielsen has further amplified this point by concluding that YouTube reaches more U.S. adults ages 18-34 than any cable network. And history--from the transition to radio, then TV, from network to cable--tells us that advertisers always follow the audience. In line with that trend, we also unveiled this evening that the ANA Alliance for Family Entertainment (AFE)--a group of nearly 40 national advertisers, whose combined ad spend represents 37 percent of all U.S. television advertising dollars--will buy media across 32 channels of family-friendly content on YouTube. Much like our content creators, we find that brands on YouTube--like T-Mobile, Samsung, Dove and Pepsi--all share a common objective: to cultivate a direct relationship with their consumers--one built on engagement and authenticity. These companies know that on YouTube, it isn’t just about rallying behind one show; it is about reaching the passionate fan communities of Gen C, an audience that influences more than $500 billion in annual consumer spending. As a result, we’re seeing a myriad of brands increasing their media spend, building channels, and discovering first-hand that the interactions they have with their fans on YouTube drive engagement. Content creators have long recognized the power of YouTube’s platform to connect with an audience. Advertisers are increasingly doing the same. Together we’ll continue to build YouTube as a global destination for the next generation of entertainment. Robert Kyncl, Vice President, Global Head of Content Partnerships for YouTube recently watched "Brent and Johnson - Equality Street." To learn more about how brands can reach key audiences on YouTube, please visit our AdWords Agency Blog. It has been an exciting year of growth for YouTube and its partners. We recently announced that YouTube hit an incredible milestone of 1 billion unique monthly visitors, connecting 15 percent of the planet to the videos they love. And those global fan communities are watching more than 6 billion hours of video each month on YouTube; almost an hour a month for every person on Earth and 50 percent more this year than last. In addition, media companies like Time Warner, The Chernin Group, Bertelsman, Discovery Communications and Comcast have all made significant investments in companies that create, aggregate or service content for YouTube in the last 12 months. And tonight at our Brandcast event for advertisers in New York, another major media company continued that momentum. DreamWorks Animation CEO Jeffrey Katzenberg announced that his company acquired AwesomenessTV, one of the most subscribed-to, teen-focused networks on YouTube. This acquisition gives DreamWorks an opportunity to align itself with Brian Robbins’ powerful, next-generation, online video powerhouse. By partnering with more than 55,000 YouTube channels that collectively represent more than 14 million subscribers and almost 800 million video views, Brian successfully created a YouTube network comprised of one of the most valuable consumer groups--Generation C. This audience is defined by its desire to be constantly connected, and at the center of creating and curating content for social communities.